Pride of Irons - West Ham United’s official LGBT supporters group – have issued the following statement ahead of the Premier League encounter against Brighton and Hove Albion on Friday 20th October. "This Friday we welcome Brighton and Hove Albion to East London for what will be our first meeting at London Stadium, and the Pride of Irons are excited to be part of an incredible and positive atmosphere. "The West Ham family is an inclusive one where, regardless of gender, age, ability, race, religion or sexual orientation, everybody feels welcome and included, as our own LGBT fans do when supporting our club both home and away. 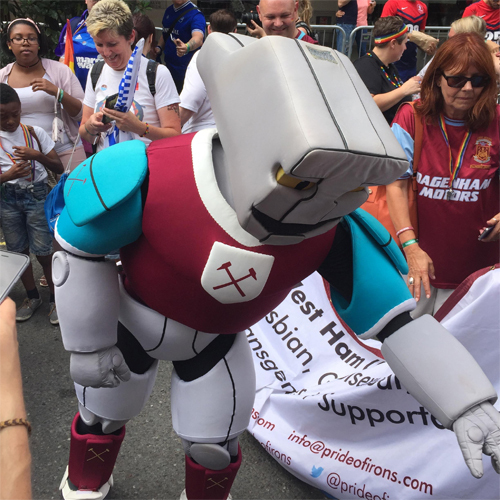 "After all, we Hammers may pride ourselves on our exuberant atmosphere, passionate support and unique east London humour, but none of these should ever cross the line into homophobia, sexism, racism or discrimination of any kind. "So please do what you do best on Friday evening – support our team, our players, our club, with pride, passion and respect, and show that London Stadium is a place to celebrate everything that is great about football." Pride of Irons was founded in 2015 as the official LGBT supporters group for West Ham United fans. Their objective is to represent and campaign on behalf of LGBT fans with a goal of combatting homophobia in football and increasing opportunities for their members to express their active support of West Ham United. However, the only requirement for membership is that you support West Ham! The group want LGBT football fans to know that West Ham United is an inclusive football club where anyone, regardless of gender, age, race or sexual orientation can feel welcome, included and enjoy being part of the West Ham family. To become a member or simply to find out more about Pride of Irons, visit www.prideofirons.com or follow via Facebook or Twitter (@prideofirons).